Stay in touch with the best practices and latest news in the world of sports arbitrage betting. Here, you will also find information how to use ArbMate, reviews of arbitrage betting related services and much more. Enjoy reading! Odds Navigator is Chrome Extension that will help you find the event pages, select the betslip, enter the amount and could load a calculator on each bookmaker. 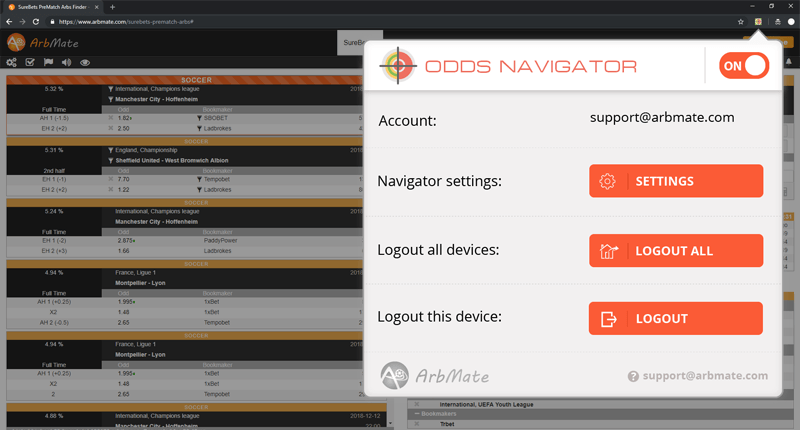 It can navigate multiple computers and virtual machines with a single ArbMate account. Download now! ArbMate now supports Olimp for Live and PreMatch events! This brings thousands of new arbs for our members. So what are you waiting for? Grab a subscription and start earning money! Doxxbet is available for navigating (autosurf) for PreMatch. ArbMate's app loads the betslip automatically and all you have to do is enter the amount and place the bet. Come and try! Which bookmakers are arbitrage friendly? ✓ Will they limit you? ✓ Which ones should I use? ✓ What is odds margin? ✓ All the answers you are looking for are here! Nike.sk is available for navigating (autosurf) for PreMatch and Live. ArbMate's app loads the betslip automatically and all you have to do is enter the amount and place the bet. Come and try! Follow us on Twitter to get news before everyone else! Which bookmakers are arbitrage friendly?